"“Counting the Fish in the Sea,” a non-fiction book for children ages 8-12, tells the true story of how researchers from the Virginia Institute of Marine Science tackle what might seem an impossible task—counting the fish in the sea. 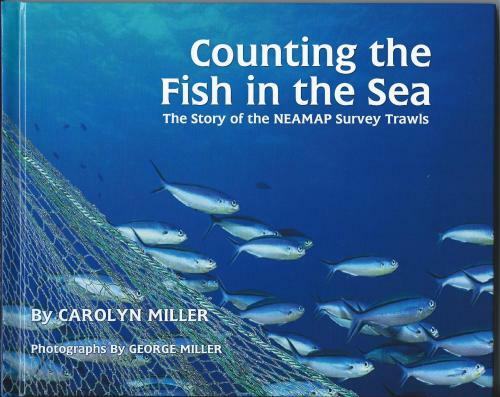 Carolyn Miller, teacher and freelance writer, explains how a NEAMAP (Northeast Atlantic Monitoring and Assessment Program) trawl is conducted and how scientists sort, count, and analyze the fish. Each page is accented with actual photographs depicting the exciting moments of a research cruise. "Carolyn Miller has over 30 years of experience in a variety of educational settings including teaching on a Sioux Indian reservation in South Dakota and at an international school in Beirut, Lebanon. Carolyn loves writing and fishing and wrote a weekly fishing column for The Cape May County Herald for 8 years. With Masters degrees in Education Administration and Religious Studies, Carolyn now works part-time for her local parish."